Since 2006, when Facebook became available to the general public, the visual practices of its users, especially the youngest ones, have been described as forms of narcissistic behavior. By analyzing the use of images in dating, this essay reconstructs what users actually do online and reveals a very different picture. From searching for profiles to deciphering their content, the practices observed make utilitarian use of the photographs, which are interpreted as indices and drive a highly pragmatic approach. The multitude of personal sources and the diversity of their content impart a great informational importance to the images, which are nonetheless carefully analyzed, with weight also given to other interactions. This exploration of the sharing and reception of images on networks highlights their transactional value, which encourages behaviors distinguished by reciprocity. NB. Illustrations 1 to 7 are screen captures taken on the 11th of September 2013 and published with the consent of the concerned Facebook account holders. The author wishes to thank the participants of the Culture Visuelle course for their enriching contribution and André Gunthert for his support and advice. 1Most research suggests that self-presentation of adolescents on Facebook is narcissistic and immodest1. Based on quantitative and semiotic analysis of visual content, these studies often disregard the different uses of images and the context in which they are viewed. If sharing personal photographs on Facebook would hinder socializing then users would stop publishing pictures to the social network site. Yet, Facebook announced a recent upload of 250 billion photos added to the site in 20132. 2This paper proposes to analyze online visual practices comprehensively, grounding research in an ethnographic methodology, based on interviews and participant observation of youth during the preliminary stages of dating3. Often initiated offline, a meeting between two potential sweethearts results in a search for their Facebook account. Although short, this period provides a specific time frame in which participants’ behavior and interaction with online images can be observed. 3Majority of active Facebook users in France are between 17 and 35 years old4. Young site members, registered since almost four years, use it primarily for networking5. An extensive use of Facebook might not guarantee a better understanding of its technical features, but it does encourage a pragmatic use of the site. Regular Facebook users consistently consult it to gather information about new contacts and potential friends. Moreover, many participants have been using Facebook since Middle school to extended their social circle through existing friends. Early adopters are therefore comfortable with the social network site and aware of using it to their advantage. 6 Verbatim accounts are extracts of the interviews. “During High school we started adding everybody because we all came from different Middle schools. In the end, there were many people whom we didn’t even know and during the first few weeks, well everybody kept adding everybody on Facebook and it allowed us to say: ‘Oh, so you know so and so, and we all have the same mutual friends6” (Lili, 18 years old). 7 An English word used by young French teens to describe their potential date. 4University parties and casual hangouts organized by mutual friends increase opportunities for extending one’s social circle. Socializing at parties and soirée is often carried out in haste, allowing less time to inquire sufficiently about new contacts. During such gatherings names and telephone numbers are often not exchanged. Whether intentionally or unintentionally, concealing this information does not seem to disturb young Facebook users because they know they can obtain it later from their mutual friends. For some participants delaying a thorough online search of a target7 might render the pursuit mysterious, for others postponing the search might mask the anguish of suffering a quick rejection. “Since everybody is on Facebook now, it has become a trend maybe and its also an indirect way, without promising somebody that you will call them. It’s more passive, without any commitment, you see”. (Julia, 17 years old). 5During the initial meeting and the search for the target’s Facebook profile, the site serves as an important playground opening up many possibilities. “The first step is to check all accessible information, without necessarily being added to his/her network” (Gaspard, 18 years old). 6Facebook allows members to navigate their personal network and search friends of friends discretely8, an indispensable search setting needed especially at this exploratory stage. During this brief period of anticipation and search, tagged photographs become a priority because they help detect mutual friends. Common friends are important because their timelines/profiles can be further consulted for more information about the target. At this stage, profile access is more important than its content since the latter depends on privacy settings. 10 Cover picture displayed as a banner above the user’s timeline (profile). 7Generally, Facebook friends grant each other complete access and mutual visibility of their activities – a privilege denied to strangers who can only access limited features for example, the name, profile9 and cover picture10 (see fig. 1). This semi-transparent visibility – transparent for friends, opaque for others – is perceived as a character trait11. “A timeline without photographs, well that happened to me recently and it made me think a little and I said to myself, ‘Well, I would like to do that too !’, because it’s true, in the end we do boast a lot and I said to myself, ‘It’s not that bad (not to have photos)’. But in the beginning, it’s true I said to myself, ‘Oh ! There is nothing !’” (Julia, 17 years old). Fig. 1. Profile and cover pictures of a Facebook Profile page / timeline, 2013. 8Limited access to photographs might astonish some Facebook users leading them to re-examine their own online presentations. However, a timeline without images arouses suspicion. “If I come across a timeline without any photos, I think that I would wait for him to start the conversation.” (Pénélope, 20 years old). “Generally, when it’s something funny, often we say (among friends), well, he must be so ugly that he hasn’t published a photo (laughs); it’s very commonplace and generally done by people lacking self-confidence. One of my very best friends also does it sometimes. Often, he will put up funny images. I know him and I know he really lacks self-confidence and physically he finds himself ugly, but he is an adorable boy and not ugly at all!” (Nathalie, 19 years old). 12 Antonio. A. Casilli, Les liaisons numériques, vers une nouvelle sociabilité ? (Paris: Seuil, 2010). 9Feelings of skepticism and surprise evoked by timelines devoid of visual content or with restricted access can be understood through the concept of gift exchange in networked communities. On the Internet a Facebook profile substitutes for a physical hangout where viewers/visitors can socialize comfortably12. Similarly, sharing photographs on social network sites is part of articulating friendship, involving tacit rules to be obeyed by all participants to ensure an amicable ambience. Moreover, a reciprocal exchange of information (published content) discourages inappropriate behavior13. Fig. 2. 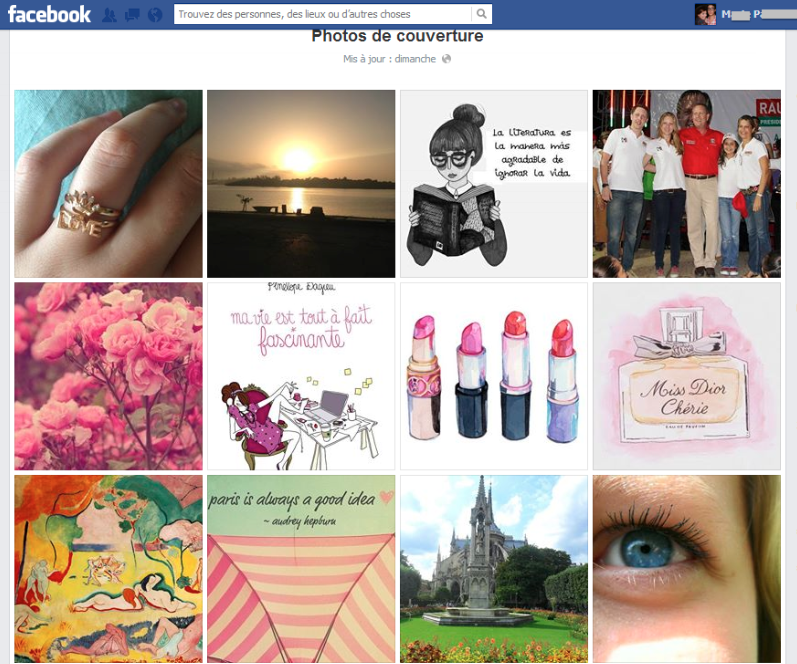 Profile picture album, Facebook, 2013. 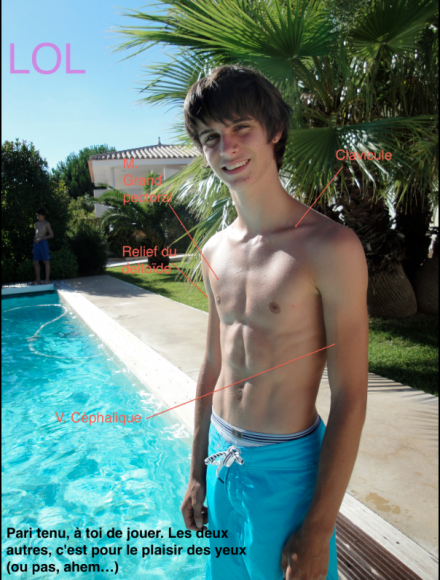 10During this preliminary stage, accessible photographs then act as useful indicators, guiding the viewer in reading the target’s personality. Timelines displaying a significant collection of photographs are attributed to attractive personalities, while profiles lacking in visual content are associated with suspicious and untrustworthy participants. “Often, profiles have restricted access nowadays, but there is this new feature, the cover photograph which wasn’t there before. So, you discover a lot of things about people in this way, because people don’t actually realize that, but they know that it is visible to everyone. So, for example, if the cover photo or the profile picture shows many friends, a party or some fun event like that, generally we say that this person is very popular and she wants to vaunt herself, just like my friend Jessy (see fig. 2)” (Nathalie, 19 years old). “I think friends are most important. So, if I can see that by looking at the profile pictures then I will go look at other photographs. And if, I see that she is with the same group of friends that would mean that she has a very well connected group of friends who have fun together. I really like Mathilde and that’s what I said to myself when I met her and checked out her timeline, that she has a really close group of high school friends (see fig. 3). I have met them all and I am very happy to have made their acquaintance through Mathilde. Now I am a part of their group! (see fig. 4)” (Arthur, 19 years old). Fig. 3. Profile picture, group of high school friends, 2012. 14 Dominique Pasquier, Culture Lycéennes. La tyrannie de la majorité (Paris: Autrement, 2005). 11Profile pictures showing a recurring group of friends confirm the target’s social appeal. Articulating friendship and displaying it publically also constitutes an important aspect of adolescent culture, where teenagers want to belong to a group and simultaneously display their membership14. Displaying friendship is considered a sign of an appealing individual possessing strong social capital (see fig. 4). The visual testimony of an extensive social circle might also inspire confidence and in most cases impress interested viewers, especially those keen on enlarging their own personal network. The next step then involves adding the target as a Facebook friend to gain full access to her profile. Fig. 4. Facebook profile picture, 2013. 12Eager to know the target, the viewer strives to gain access to her profile primarily to ascertain her sentimental status and social station. During this affective context, profile viewers scrutinize every possible detail as a clue, which is then interpreted according to the viewer’s personal experience of Facebook15. Once basic identity information is glanced over, focus is directed immediately towards geographical location to estimate proximity. Next, information about the high school is checked to locate mutual friends. Even if the target has mentioned her sentimental availability it is still double-checked especially, by looking at recent photographs. 13During this investigative process photographs are thoroughly re-examined. All pictures published, both by the target and those added by her entourage are scanned in detail. 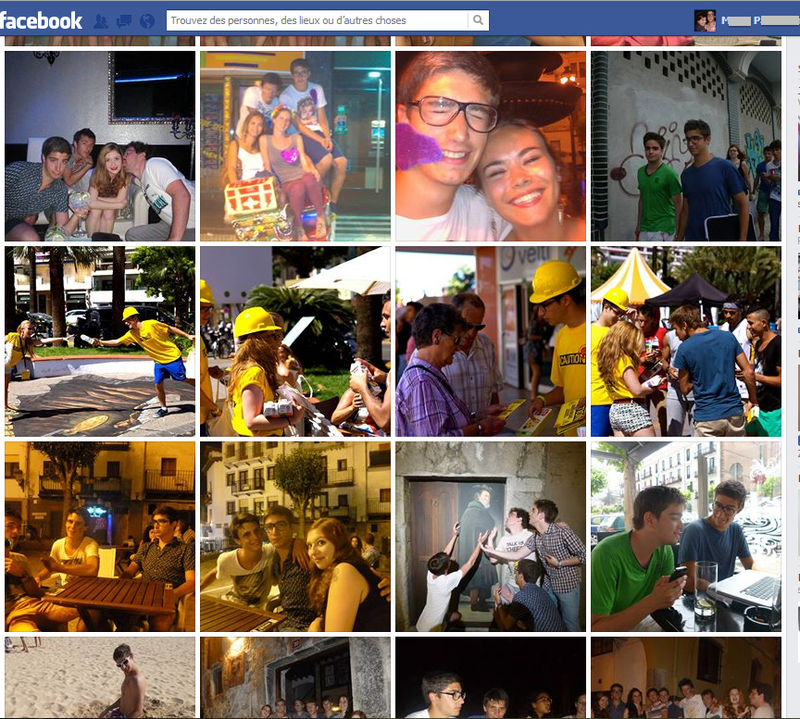 The frequentness with which pictures are published serves an indicator of how often the target uses Facebook. 14Interestingly, photographs are valued for informative rather than esthetic qualities. Holiday photographs and those of various leisurely activities are viewed to establish the target’s personal taste and cultural preferences. Comments, replies and likes associated to these photographs are also read to authenticate visual information and evaluate the target’s social clout. “You try to see what type of person he is and with the photos you can see if he travels. For example, you can find out what type of friends he has. You can’t see where he lives, but if he has hobbies there will be some pictures of sports. Often, for guys it’s that or music. Sometimes, there are many people who upload soundtracks and songs they like listening to” (Julia, 17 years old). 15How are photographs actually read? No single reply can answer this question and no specific evaluation check-list is followed by these youth. Instead, participants are guided by their own usages through this hermeneutic process. In addition to their visual culture, they also rely upon personal experience and time spent on the social network site. “There are those who pay attention to their private life and never publish their picture or anything else. They upload pictures of things they like. 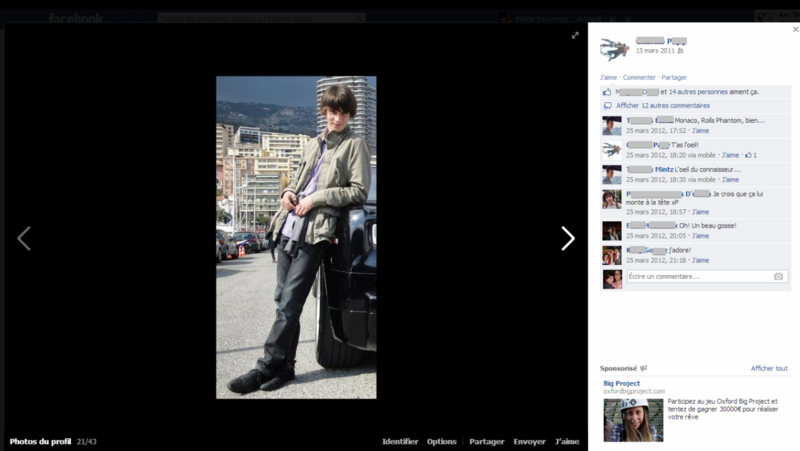 My cousin Martin, for example, as his cover picture he has uploaded a poster of Pink Floyd (see fig. 1). 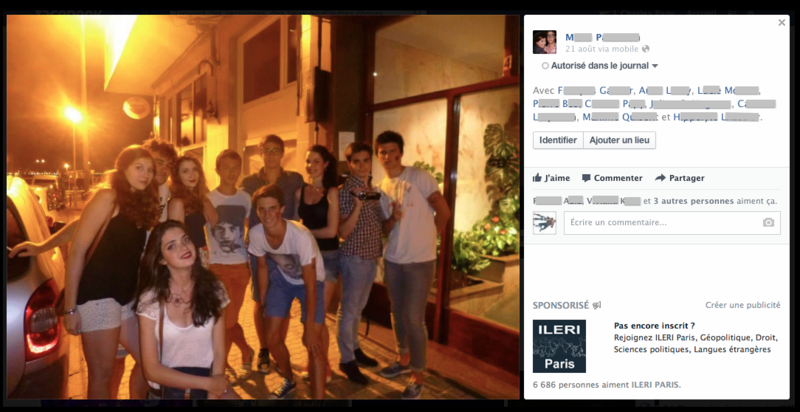 Then, there is my Mexican pen pal, she loves Paris and mostly uploads cover pictures of Paris (see fig. 5). So, it allows you to find out about the person’s favorite music band, whether she likes nature, if she likes, I don’t know, comics, movies, vintage photography. In my opinion, all this information really speaks a lot about the person without their knowledge of it. So, being a twisted girl, I analyze, and there are interpretations” (Nathalie, 19 years old). Fig. 5. Cover pictures album, Facebook, 2013. 16The information is searched primarily to evaluate the person’s disposition, her interests and dislikes, in order to prepare the grounds for casual talk. However, without any formal training in deciphering photographic information, observations made about a friend, a cousin or a pen pal’s use of Facebook often help the viewers in constructing their personal interpretive check-list, which remains very subjective. 17 Erving Goffman, The Presentation of Self in Everyday Life (New York: Anchor Books, 1959). 17Interestingly, the belief in photography’s revelatory powers is attributed to its ability to record the essential as well as the superfluous: information communicated voluntarily and involuntarily, the latter considered authentic according to this conception, because it is not controlled intentionally16. Similar to face-to-face conversations where behavior is read as an assemblage of expressions given and given off17, the profile viewer believes that superfluous photographic information is predisposed to reveal the subject’s true intentions – read as information given off. 18However, most Facebook users are not oblivious to the shortcomings of this self-taught hermeneutics. “If the person only publishes photos to give off an impression, for example, if she uploads fifty photos and forty-eight of which are taken at the same party and I see these fifty pictures without realizing that they are all of the same party, I might deduce that she is a party animal. We can make mistakes. It’s not an exact science!” (Marco, 19 years old). 19Even though photographs provide multiple social contexts and affiliations of the target, visual content is still analyzed carefully and always compared to the number and frequentness of the comments it yields. “It is important to see the person interacting with other people as it can be used to see his social appeal. If it turns out that the person does not posses a large social network and nobody reacts to his photographs or, that he has only uploaded pictures of himself and none with his friends, it would be a big turn-off for me!” (Agathe, 25 years old). 20Complete profile access calls for a detailed examination of maximum information. If photographs are a fast track to acquire essential information, interpreting, checking and counter checking photographs still remains a considerable task. The detailed reading of pictures also indicates the level of commitment of these young adults. Moreover, the growing interest and attraction for the person solicited inspires a strong desire to dismiss all doubts and avoid deception of fake presentations18. 21Youth are aware of the drawbacks of their hermeneutics and this self-awareness motivates them to call upon their friends for reinforcement. During this trail period only very close friends are considered worthy confidants. Discretion is of prime importance, especially to avoid mockery from Facebook friends. “We talked about it, with my girlfriends, generally, my best friend, but then again it’s only between girls” (Nathalie, 19 years old). 22Photographs already selected by the viewer are then decoded extensively for a second opinion. Collective intelligence can improve or rectify the profile analysis. At this stage, since the viewer’s attraction and feelings await reciprocation, sharing and discussing with a close friend can ease the tension of doubt. Relying on the support of close friends also reduces chances of pure conjecture. “We were looking at the pictures of a girl and Margot, my friend, she taught me how to analyze the profile in depth by comparing the number of photos in which she could be seen, where she hung out, the number of photos in which she was with her buddies, those in which she was well dressed, others where she wasn’t. With all this information, Margot deduced that this girl wasn’t really cool at all. Actually, Margot was right! We can really get to know somebody, if we have the ability to deduce with real precision (laughs)” (Pierre, 17 years old). Fig. 6. 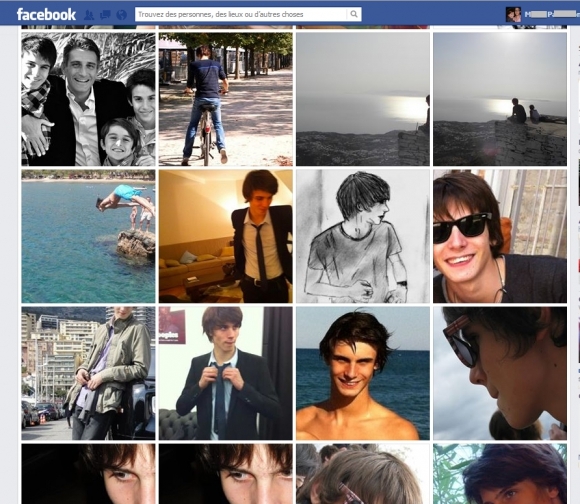 Profile picture album, Facebook, 2013. As the investigation continues, similar interests and affiliations are susceptible to appear which can in turn deepen the viewer’s desire to contact and impress the target. 19 Identifying a Facebook user in any published content on the site. “We had fun while looking at the photographs, the profile pictures first (see fig. 6), followed by those on which he was tagged19. We had a good time together looking at the pictures. In one of his profile pics, he looked as if he was 12 years old (see fig. 7)” (Nathalie, 19 years old). Fig. 7. Profile picture, Facebook, 2011. 20 Somebody who tracks Internet users without their knowledge. 23Even though, analyzing photographs with reliable friends might not add to existing appraisals of the target, this friendly support reassures and comforts young courters during this unpredictable period. Discreet and brief correspondence with the target ends pure speculation. In addition to making common references for example, to the party where they met and their mutual friends, the first message is written in a humorous style, punctuated with many emoticons to ensure a carefree tone, dismissing the risk of being labeled as a stalker20. Once the conversation is initiated, it ends the profile hermeneutics. The frequency with which messages are exchanged and the style in which they are written, these two factors are read as an indicator of the participants’ intensity and level of commitment. “In the beginning its was very fast, we talked a lot, a lot, a lot and then it became more spaced out. We talk everyday, but before it was every half an hour, every hour. Now, we are discovering each other at the same time and we are also planning on seeing each other. It’s taking more time, I think, in comparison to the first stage” (Pénélope, 20 years old). 24During this conversational stage, seduction takes over analysis and personal photographs are no longer read for the clues they might hold but to sustain playful conversations. During this phase images are used in a more exclusive, funny and direct way. The social network then serves both as a filter to test affinity and as a playground to extend it. “He emailed me this photo (see fig. 8) during a chat we were having. It wasn’t the same evening of our first meeting, but I knew that there might be something between us. I found this photo very amusing and it was the only one in which he could be seen in full figure. I sent it to Candice to ask what she thought of him, it made her laugh as well and she replied to me saying that he was a dish! We often do this to have a good laugh and also for a second opinion!” (Nathalie, 19 years old). Fig. 8. « LOL », digital photo, private collection. 25The preliminary investigation undertaken by youth on Facebook allows them to be informed about their potential date before indulging in an extensive interaction. The images published on profiles are valued for informative quality, not only for what they show, but also the frequentness, quantity and the conversations they yield. The belief in photography’s revelatory power is quickly challenged by the limitations of the interpretive exercise and the need for thorough, collective investigative work. 26The transactional value of images shared in online networks proceeds from their informative quality. Exchanging photographs across networks establishes reciprocity, thereby transforming every published visual content into a proposition accepted or rejected, depending on the participant’s motivation to interact. Contrary to the development of a collective narcissism following from visual practices on Facebook21, this study demonstrates a pragmatic utilization of images for successful socializing; behavior which constitutes a new culture of visual conversations – an analysis possible to extend beyond dating and to other contextual frameworks. 1 David Houghton et al., “Tagger’s Delight? Disclosure and Liking Behavior in Facebook: The Effects of Sharing Photographs Amongst Multiple Known Social Circles”, University of Birmingham, 2013 (http://epapers.bham.ac.uk/1723/1/2013-03_D_Houghton.pdf). 2 “More than 250 billion photos have been uploaded to Facebook, and more than 350 million photos are uploaded every day on average”, A Focus on Efficiency, Facebook/Ericsson/Qualcomm whitepaper, September 16, 2013, https://fbcdn-dragon-a.akamaihd.net/hphotos-ak-prn 1/851575_520797877991079_393255490_n.pdf). 3 This article is based on an ethnographical research conducted with fifty students, majority of whom are medical students living in Paris and its suburbs. Fifteen semi-structured interviews were conducted with these students between the ages of 18 and 25 years old. Most of these young adults belong to different social backgrounds. The daily face-to-face and mediated interactions with these young Facebook users and their friends were conducted during a period of three months (names have been modified to protect their identity). 4 Marian Moreau, “Facebook compte 26 millions d’utilisateurs en France”, FrenchWeb, September 5, 2013, http://frenchweb.fr/facebook-compte-26-millions-dutilisateurs-en-france/125450. 5 Pascal Lardellier, Les réseaux du cœur. Sexe, amour et séduction sur Internet (Paris: François Bourin, 2012). 8 danah Boyd et Nicole Ellison, “Social Network Sites: Definition, History, and Scholarship”, Journal of Computer-Mediated Communication 13, no. 1 (2007). 9 Picture displayed next to the Facebook account holder’s name. This photograph is displayed alongside the user’s name during almost all communications. 11 Dominique Cardon, “Le design de la visibilité. Un essai sur la cartographie du web 2.0”, Réseaux no. 152, 93-137 (2008). 13 André Gunthert, “Usages de l’image sur Facebook (notes)”, Actualités de la recherche en histoire visuelle, September 25, 2009, http://www.arhv.lhivic.org/index.php/2008/09/25/819. 15 See Carlo Ginzburg, Mythes, Emblèmes, Traces, Morphologie et Histoire (Paris: Flammarion, 1989), 178. 16 See André Gunthert, “Du bruit dans l’image (l’homme a-t-il marché sur la lune ? )”, Atelier des icônes, November 14, 2009, http://culturevisuelle.org/icones/124. 18 See Judith Donath, “Signals in Social Supernets”, Journal of Computer-Mediated Communication 13, no 1, 2007, http://jcmc.indiana.edu/vol13/issue1/donath.html. 21 Zizi Papacharissi, “Look at Us: Collective Narcissism in College Student Facebook Photo Galleries”, The Networked Self: Identity, Community and Culture on Social Network Sites (New York: Routeledge, 2010). Fatima Aziz, « Visual Transactions », Études photographiques, 31 | Printemps 2014, [En ligne], mis en ligne le 10 juillet 2014. URL : http://journals.openedition.org/etudesphotographiques/3490. consulté le 19 avril 2019. Fatima Aziz is preparing her doctoral research on the contemporary uses of images shared on social network sites at the École des Hautes Études en Sciences Sociales (EHESS) under the supervision of André Gunthert. 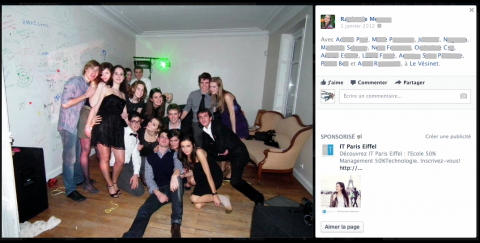 During 2010 and 2012, she was teaching assistant for “Technological Challenges of an Information and Communication Society” at École nationale supérieure des télécommunications, ParisTech.